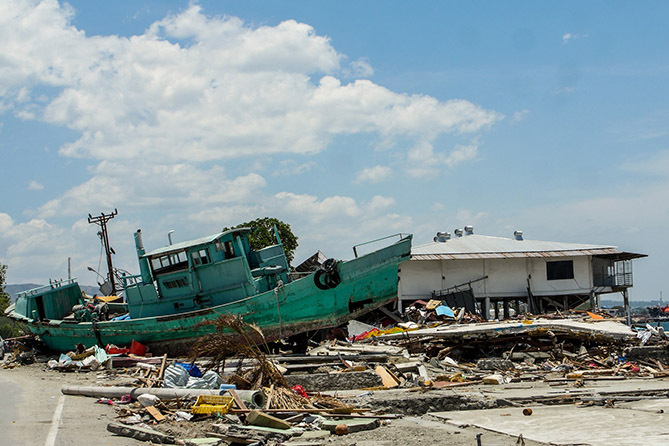 Give to the Indonesian tsunami relief fund. 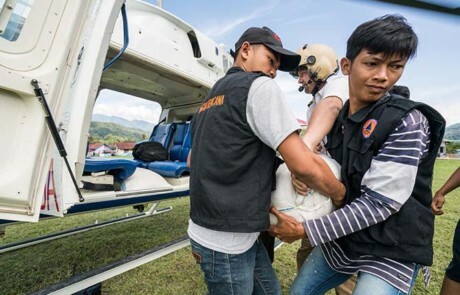 MAF is continuing to respond to the disaster on Sulawesi Island, Indonesia, caused by a 7.4 earthquake and subsequent tsunami that occurred on Friday, 28 September. Please consider making a special donation to the MAF flight fund that will help us respond to flight requests as they are made. Click the dates below for additional updates on our response in Indonesia. Stanley Lepar’s miraculous reunion story. 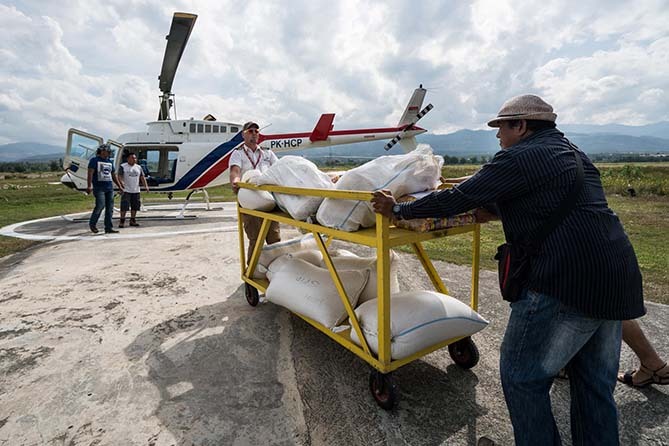 Today Yayasan MAF Indonesia (MAF) has been busy flying three tons of rice, two full medical teams and medicine to the village of Lindu, 20 minutes south of Palu. This area had been particularly hard hit by the earthquake. 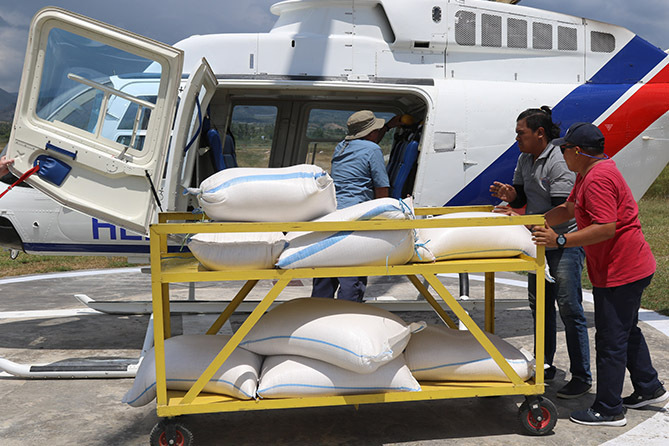 In order to expedite the unloading of the rice we sent one of our MAF Papua staff, Stanley Lepar, to stay and unload every time the helicopter arrived with a load. The other Papua staff stayed here in the hanger in Palu to refuel and load while the pilot remained in the helicopter. 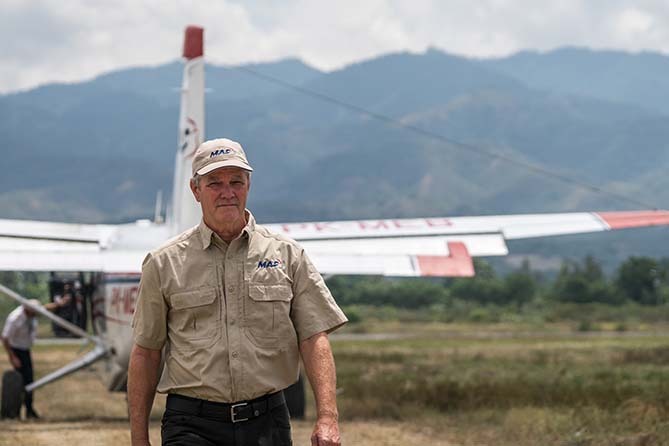 Stanley is scheduled to leave today after being in Palu for 10 days helping with the team from Papua. He asked me if he could volunteer to go on today’s flight before his flight home to Sentani. Stanley’s wife is from the Lindu area. His mother-in-law and extended family members were in the village and had not been heard from since the earthquake. When Stanley stepped out the helicopter and helped unload the rice bags, he was queried by the people of the village for his name and family history. 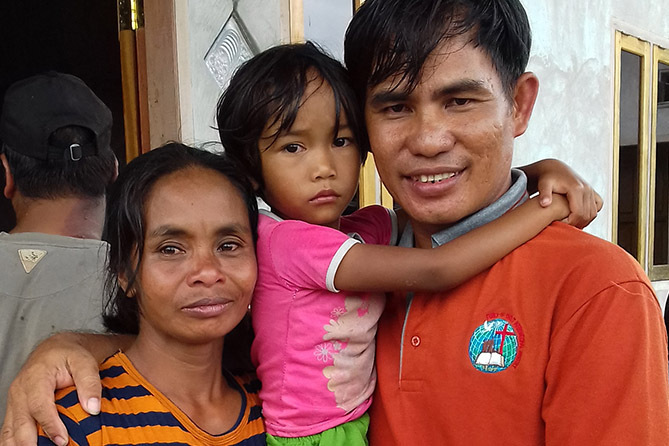 Everyone was very emotional to find that Stanley had been brought directly to the village, (Lindu-Kanaan), where his mother-in-law, her sister and brother, as well as the grandmother of his wife, Berta were located. It turned out they had not been able to communicate due to poor connectivity of the cell towers damaged in the earthquake. 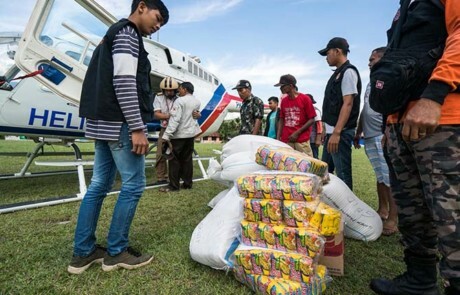 When the flight to deliver supplies was requested by the Samaritan’s Purse Indonesian team, they were not sure exactly which village to go too. We looked at maps and found Lindu-Kanaan and decided that would be the best place to deliver the rice. Stanley’s family kept exclaiming what a miracle it was, and had an incredible emotional time catching up as a family for the next two hours before Stanley had to leave on the last helicopter supply flight that day. When Stanley arrived back in Palu he had a beaming smile from ear to ear and was talking wildly in Indonesian. I don’t speak Indonesian but I could tell something wonderful had happened. To hear the story brought tears and great joy to the team here in Palu. We are glad to be here reaching out to those who need help. 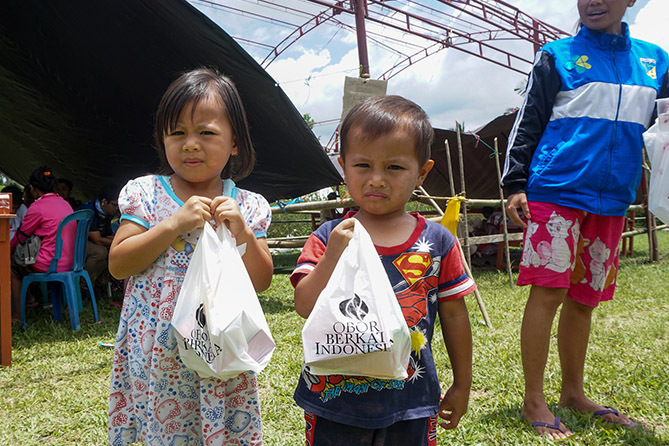 Thank you for your prayers and support, it is making a difference here in Sulawesi. 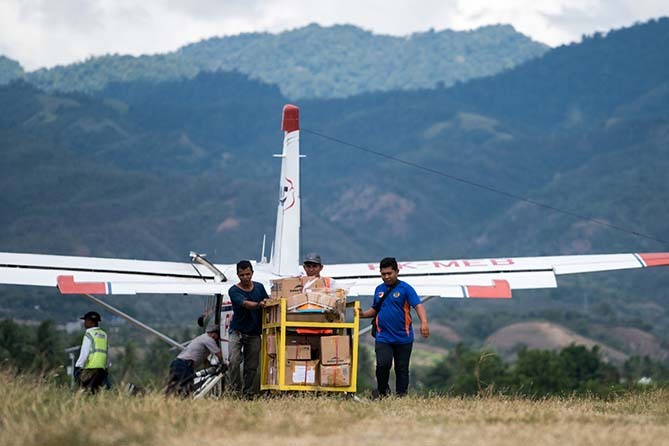 MAF and Operation Blessing deliver medicine. 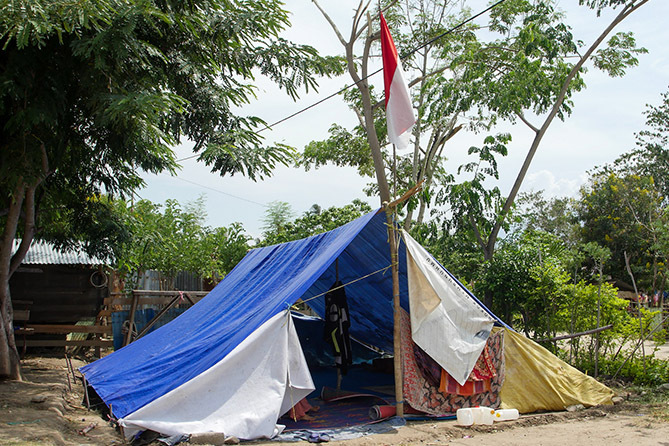 Operation Blessing’s Indonesian branch, Obor Berkat (OBI), sent two teams of doctors to Palu just days after the earthquake and tsunami devastated the city leaving homeless and injured residents setting up makeshift tented camps across the town. 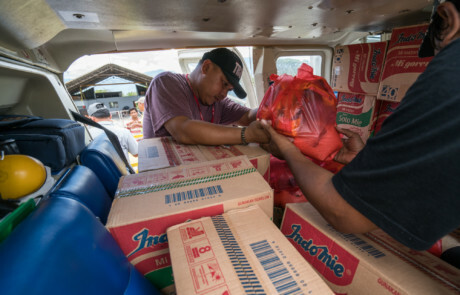 The doctor/nurse teams began holding clinics, moving from camp to camp, trying to provide basic care, but Mark McClendon, who was overseeing the operation, was struggling to get their cargo of medicine to Palu. What they found during the first week of disaster response were patients primarily with injuries and broken bones from the tsunami and debris falling on them. Many flesh wounds had become infected from the dirty seawater or mud with no source of clean water. By the second week, the doctors were seeing fewer flesh wounds and more diarrhea from kids drinking polluted water. OBI provided some basic chlorine tablets, mobile filtering units, and even solar powered lanterns to the families. Mark McClendon heard many heartbreaking stories of terror firsthand. One of the first people the team treated on the third day was Nur from Petobo where the liquefaction turned the ground to a quicksand-like mud that swallowed people and homes. 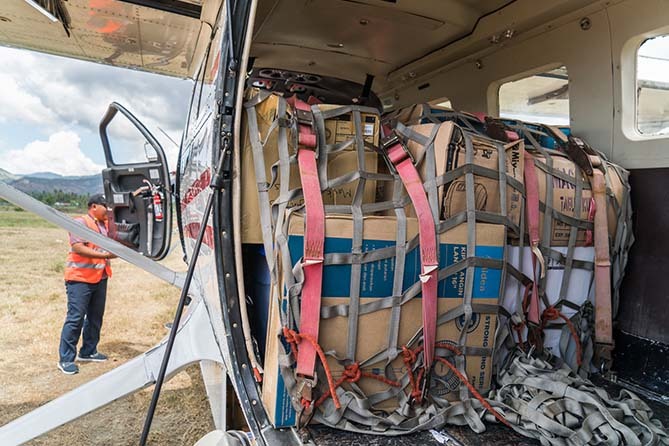 Following the arrival of the medicine in the MAF Kodiak, OBI began to send one team by helicopter into the mountain areas south of Palu, flying each morning on the Helivida helicopter and returning at end of day. OBI plans to stay for approximately two months in Palu and the surrounding areas until the major medical needs of the people are met. 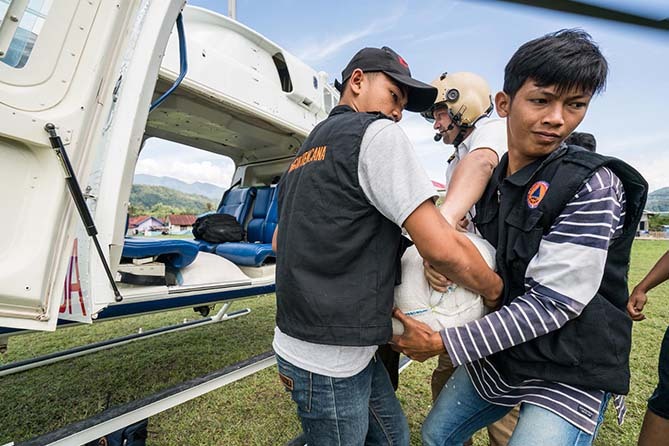 Yayasan MAF Indonesia and Helivida will continue to provide flight services into these remote communities. 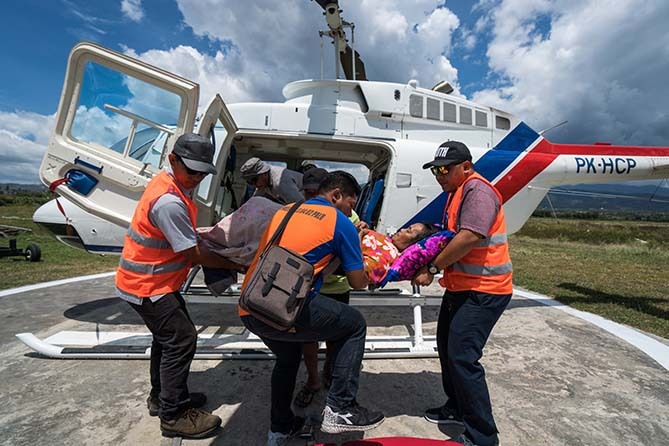 It was a busy Monday for the team of pilots and ground staff in Palu Indonesia for both Yayasan MAF Indonesian’s Kodiak and Helivida’s helicopter, delivering food, a full plane of medicine, two medical evacuations, and flying doctors in and out of two communities cut off by damaged roads. 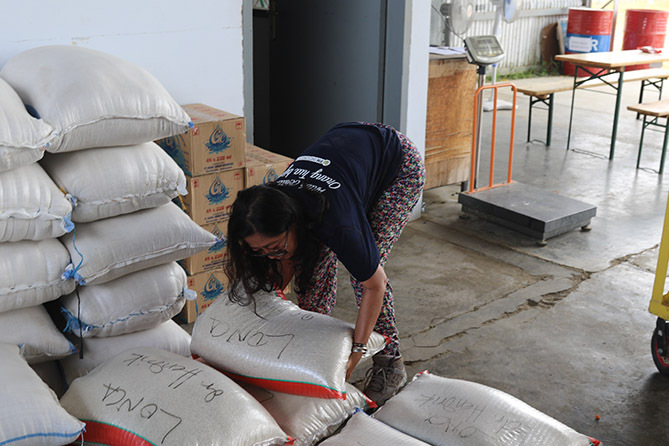 Two organizations, Yayasan Alpha Omega and World Share from Korea, working with a local church, donated food to be delivered to the communities of Kulawi and Omu that have been trapped without road access since the earthquake on 28 September. 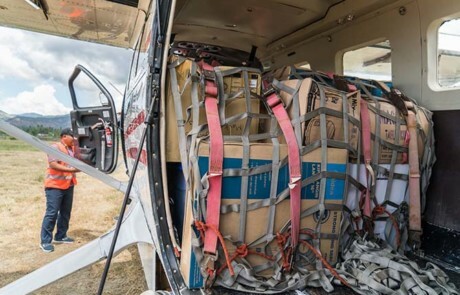 On two separate helicopter trips, two women who suffered serious bone fractures from 10 days earlier were finally able to get to a hospital for professional medical treatment in Palu. 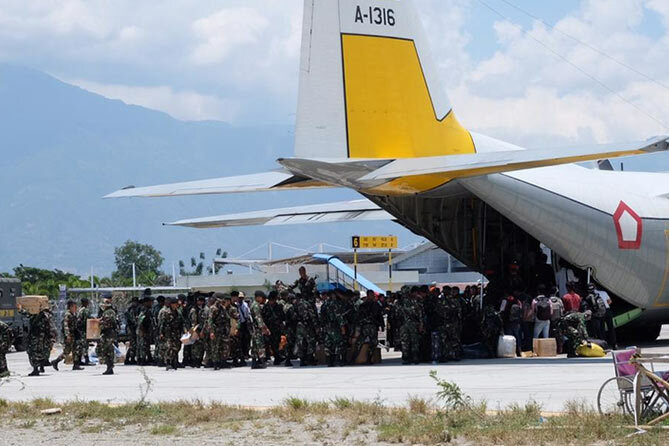 More medical evacuations are expected to happen in the next few days. 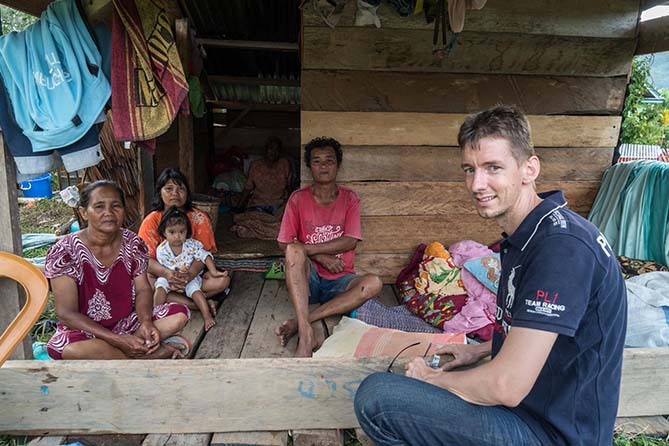 Doctors flew in and out of the same two isolated communities. 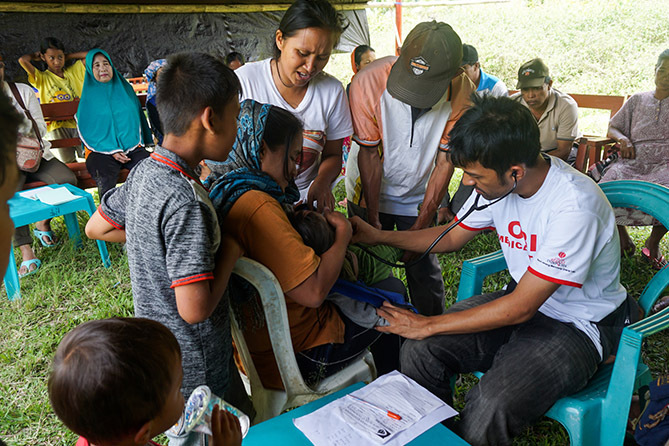 A doctor and nurse from Yayasan Alpha Omega flew early to Omu to treat patients and find those who needed medical evacuation. Dr. Ellen, a local doctor who is not affiliated with any organization, flew to both Kulawi and Omu, coming back with the medevac patients. And three government doctors who had flown into Kulawi the previous day returned to Palu Monday afternoon. 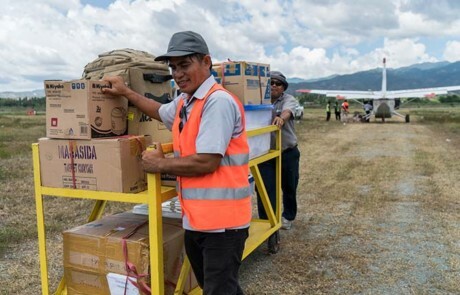 The Kodiak plane, piloted by Yayasan MAF Indonesian’s Dave Ringenberg, delivered a full cargo load of medicine from Balikpapan to Palu for Operation Blessing’s Indonesian branch, Obor Berkat Indonesia, for their two medical teams that are holding clinics for displaced people who lost their homes in the earthquake and tsunami. 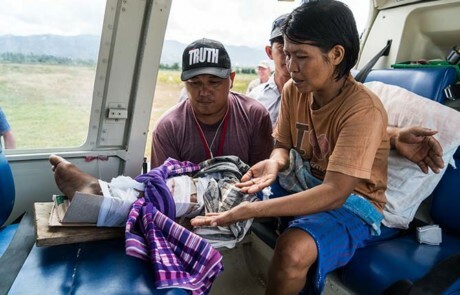 It was amazing to see how just one day can make a difference in the lives of many here who are suffering thanks to the work of individuals and organizations committed to doing what they can no matter how small, from a single Palu doctor or small local church to large humanitarian organizations. It was a great day. 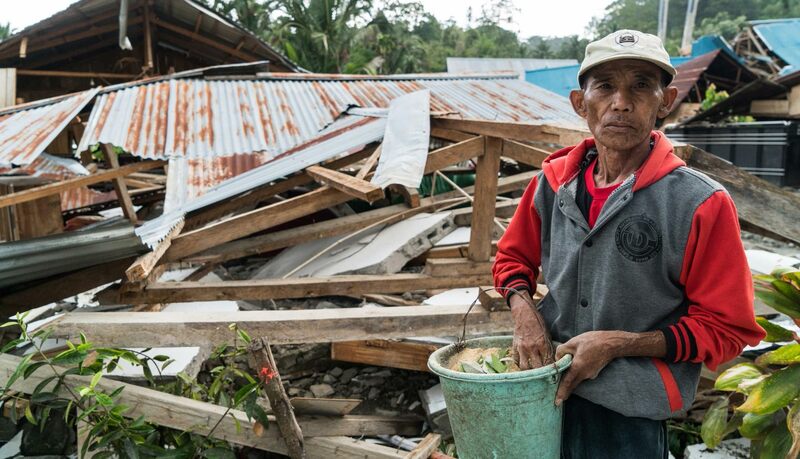 Until some major excavation takes place, the community of Kulawi in Indonesia is left isolated between multiple landslides that have cut off access in or out except by foot or air. The community of Kulawi, tucked in the mountains south of Palu in Indonesia, did not make international news when a 7.5 magnitude earthquake struck on 28 September. It was not in the path of the tsunami that followed. Houses weren’t sucked into mud like in Palu. But homes and buildings around Kulawi did crumble in random fashion – lightly in one village, entirely in another. And until some major excavation takes place, the area is left isolated between multiple landslides that have cut off access in or out except by foot or air. 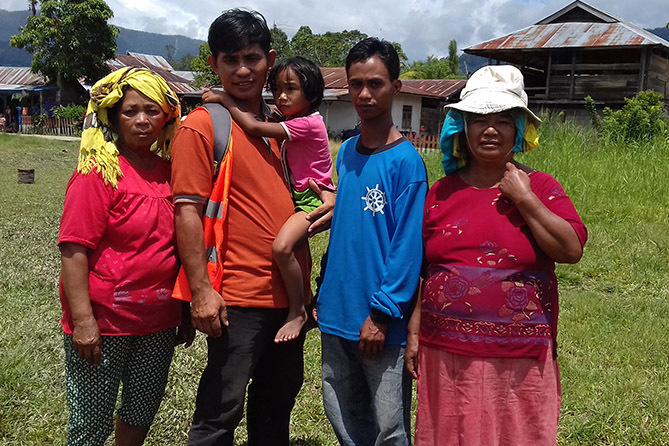 Yayasan MAF Indonesia (MAF Indonesia) and partner Helivida suspected that villages further inland from the coast had suffered damage. 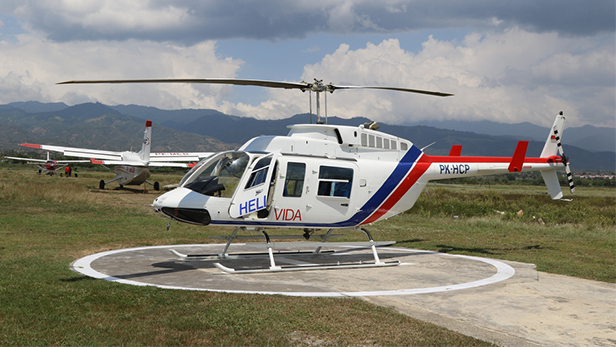 Flying the Helivida helicopter south from Palu, the wide flat valley narrows and the road climbs and hugs the mountain curves. The team observed landslide after landslide completely blocking the road in numerous places. 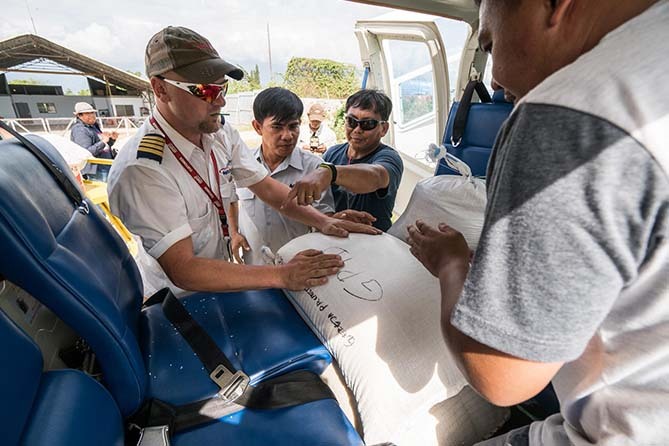 When the aircraft landed in the Kulawi town center, MAF’s Disaster Response Manager, Rick Emenaker, along with John Gorenflo and pilot Matthias Geiger, spoke to community leaders who explained that their food supply would last only one week. Less than 10 minutes by motorbike from Kulawi lies the rubble of a small village called Boladangko. Until 28 September, it was home to more than 500 people and 160 houses. Walking down the main street is a surreal scene of wreckage, a pile of concrete and wood here, a roof with no walls attached there. Someone points to a pile of white and green concrete. That was the school, he says. House after house, a store, a church, community center, and more houses. All destroyed. The community of Boladangko is now displaced. Some have set up tents along the river. 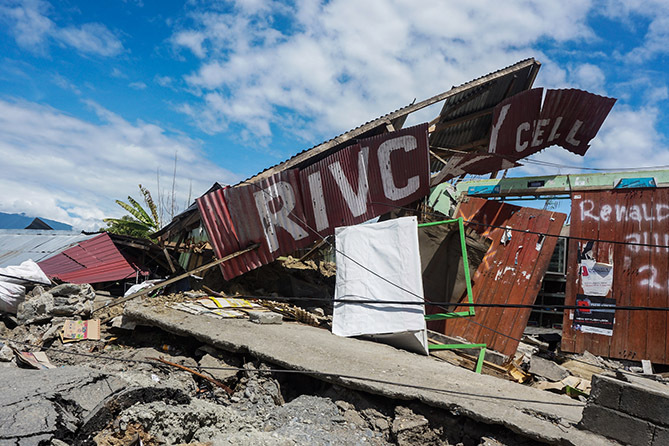 Others are building shacks along the edge of Kulawi’s town center using material recovered from the rubble – pieces of wood and sections of tin roof. They don’t know what they will do in the future. They can’t think that far ahead. Right now, it’s just about food in their mouths and a cover for their heads. Two days after the first visit, two Indonesian doctors, a husband and wife along with their daughter, showed up at the Helivida hangar where Yayasan MAF Indonesia is sharing an office asking for a flight to Kulawi to assess the medical needs and bring a small bit of medicine. A local Palu church also wanted to help by offering food. 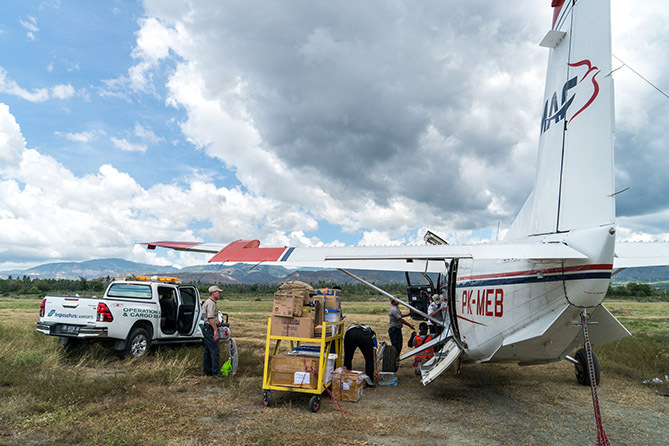 MAF in partnership with Helivida provided the flights to bring the doctors one day, and 413 kilos of food and medicine the next. Mission Aviation Fellowship (MAF) continues to privide disaster relief flights to facilitate aid efforts on Sulawesi Island, Indonesia, following a deadly earthquake and tsunami on 28 September 2018. 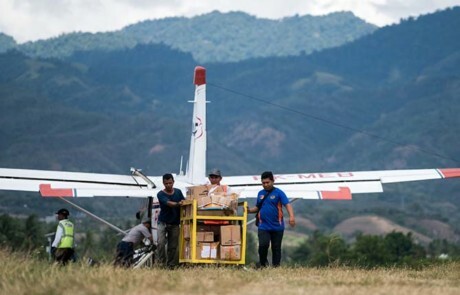 MAF is a Christian that uses its fleet of 128 airplanes to help those living in the most isolated parts of the world, giving the residents of those areas a chance for a better life. 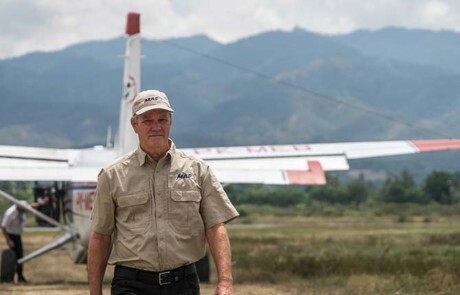 When natural disasters strike, MAF’s experienced disaster response teams are able to mobilize quickly, providing air transportation, VSAT communication systems, and logistics expertise so that help can reach those in need. 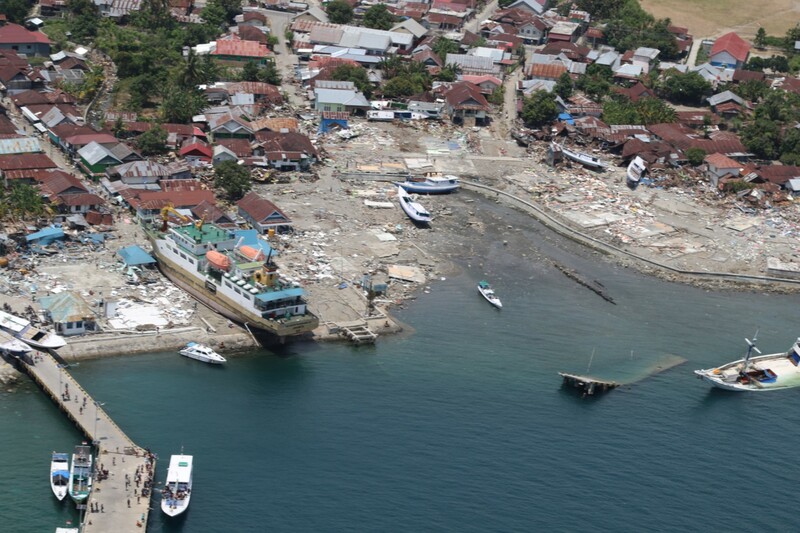 According to data released on 3 October by the ASEAN Coordinating Centre for Humanitarian Assistance,1,407 people died when a 7.4 earthquake shook Sulawesi Island, triggering a tsunami that devastated the city of Palu and areas nearby. More than 65,000 houses have been damaged and 71,000 displaced people are sheltering at 141 evacuation sites. 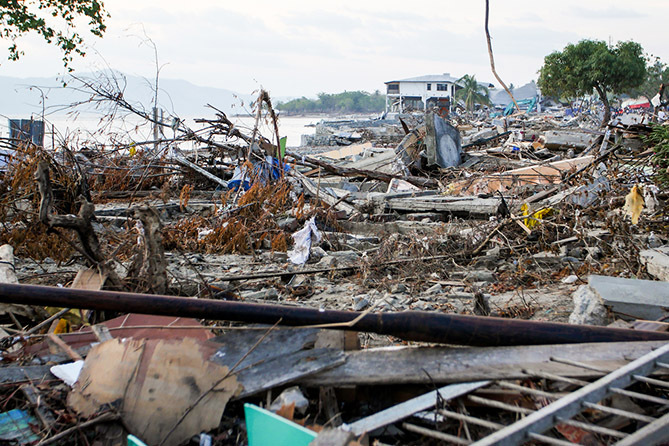 ‘Our folks at the site are seeing houses that have crumbled, huge boats stranded on land by the tsunami, and some areas near the shore that have been wiped clean of any structures,’ Woodberry said. As aftershocks continue in the area, many people are sleeping outside. 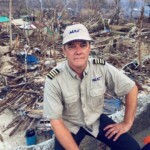 The MAF team arrived in Palu on Tuesday and immediately set to work. Since a lot of communication infrastructure has been damaged by the quake, MAF has set up a VSAT communication system at the Palu airport. This allows aid agencies to communicate with their teams in other places. For more than 60 years, MAF has been providing flight services in what is now the country of Indonesia. The organization has 150 staff and 15 airplanes at seven permanent bases across the vast island nation. ‘Our personnel know the local language and culture, which is a big help in a disaster situation. It allows us work more effectively, so those who need help get it sooner,’ said Woodberry. MAF receives the majority of its funding from donors. Those wishing to contribute to our global ministry will be helping us respond when the next disaster hits. Mission Aviation Fellowship was founded in 1945 by WWII pilots who had a vision for how aviation could be used to spread the gospel. Since that time MAF has grown to a global family of organisations serving in 27 countries worldwide. The ministry’s recent work includes assisting in the aftermath of earthquakes in Papua New Guinea, helping combat an Ebola outbreak in the Democratic Republic of the Congo (DRC), and providing food and other necessities for thousands of refugees in the DRC. Story and Photos by MAF UK. 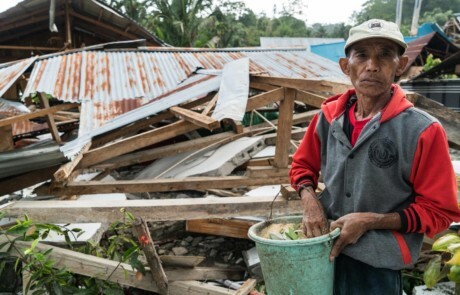 Disaster Response Update – Sulawesi, Indonesia. The MAF Kodiak flew another flight for the Swiss embassy, bringing in personnel from Balikpapan. The helicopter flew south to look at damage and saw much more destruction than they expected given that this area was far from the epicenter. 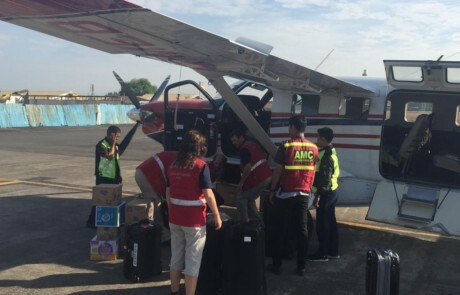 Friday, the MAF Kodiak is scheduled to conduct two flights for Samaritan’s Purse, bringing personnel from Balikpapan to Palu. There will probably be more SP flights in the coming days. 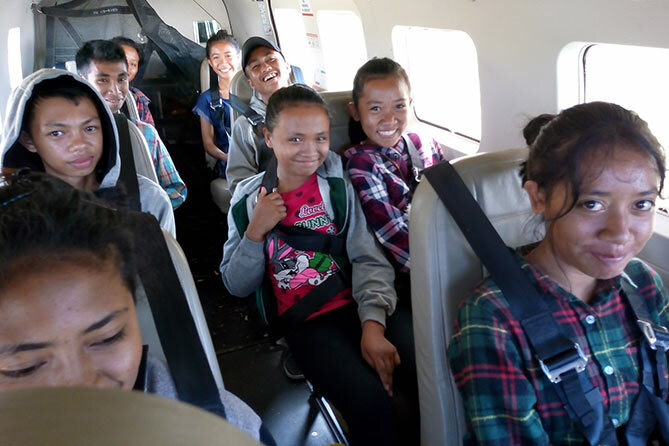 Friday, the Ethnos360 Aviation Kodiak and the Helivida helicopter are scheduled to fly 18 school children from Palu back to their villages. “This devastation today was different. Yesterday we flew [north] and saw the tsunami wave destruction, we saw ships on the beach and property destroyed, but right up from that the road was still functioning. We didn’t see a big need for what MAF does. “Today was a tougher day. We flew yesterday up to the north and up to the epicenter. We were a bit surprised that we didn’t see more destruction. 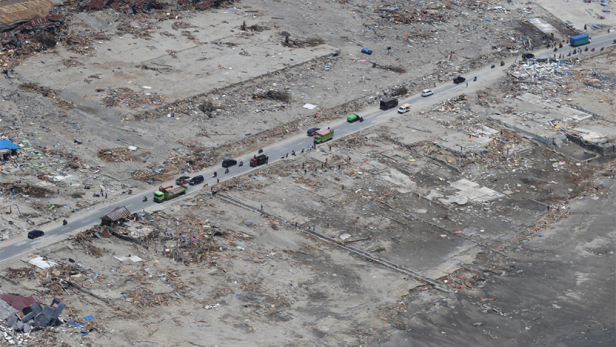 We saw some, and what the tsunami did. We were expecting more. “Today was different. There was a lot of damage. The road was completely cut off. The village where we were at with about 5,000 people – they’re hurting. Others south of there are also hurting. But I think we have the uniqueness that we have a helicopter here that can do some work. We partner with others and will see what we can do to help the people there. Our team is tired and will appreciate your prayers. Continue to pray also for all the hurting people. And let’s lift up that village of 5,000 people. 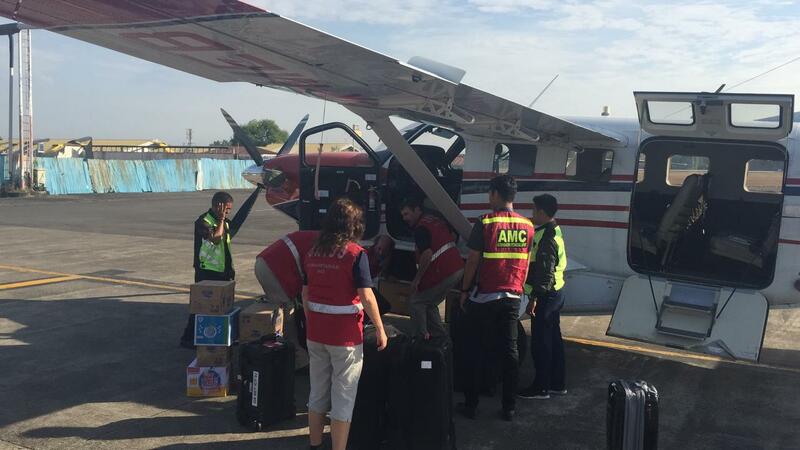 MAF is continuing its disaster response (DR) work on Sulawesi Island, Indonesia. Our disaster response staff now expect that the work will be ongoing for a couple of weeks, as we have received several call from relief agencies inquiring about possible flights. On Wednesday, October 3, MAF conducted a flight in Kodiak PK-MEB to bring Swiss embassy staff to Palu. They are conducting another Swiss embassy flight today. 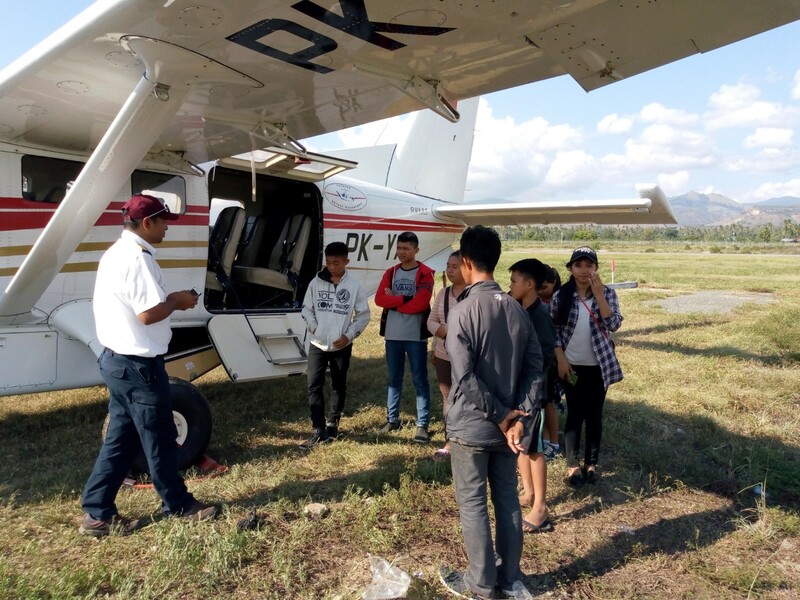 MAF’s Craig Hollander helped with an Ethnos360 Aviation flight to evacuate school children from Palu to Ampana. The DR team also provided food for these kids, who had been waiting at the hangar for several days. 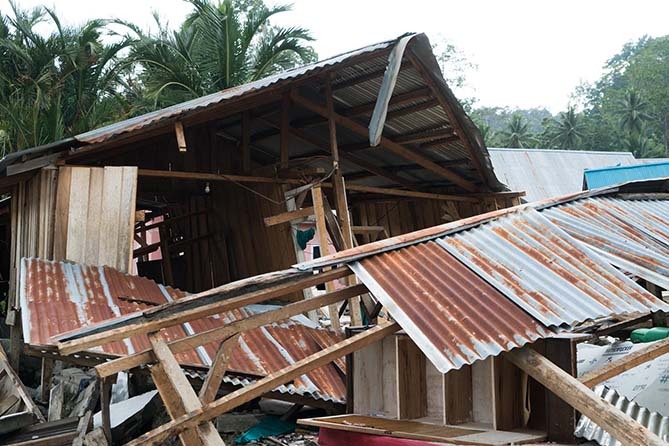 MAF’s Disaster Response Team along with our programs in Papua and Kalimantan, is responding to the disaster on Sulawesi Island, Indonesia, caused by a 7.4 earthquake and subsequent tsunami that occurred on Friday, 28 September. 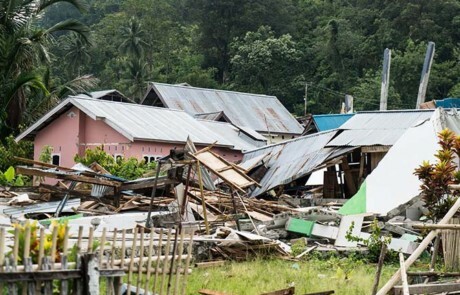 MAF’s Disaster Response Team along with our programs in Papua and Kalimantan, is responding to the disaster on Sulawesi Island, Indonesia, caused by a 7.4 earthquake and subsequent tsunami that occurred on Friday, 28 September. 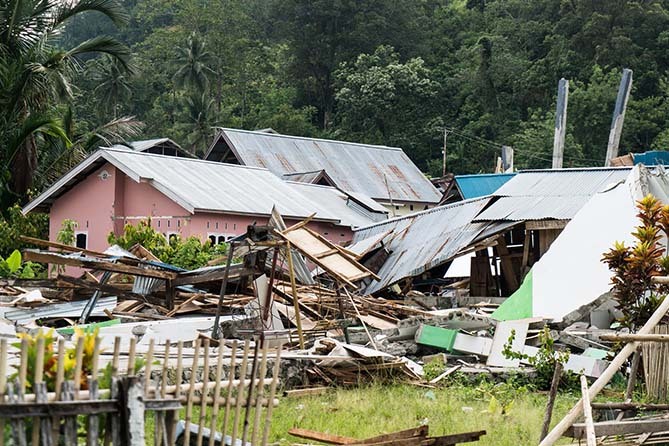 The city of Palu was especially hard-hit. 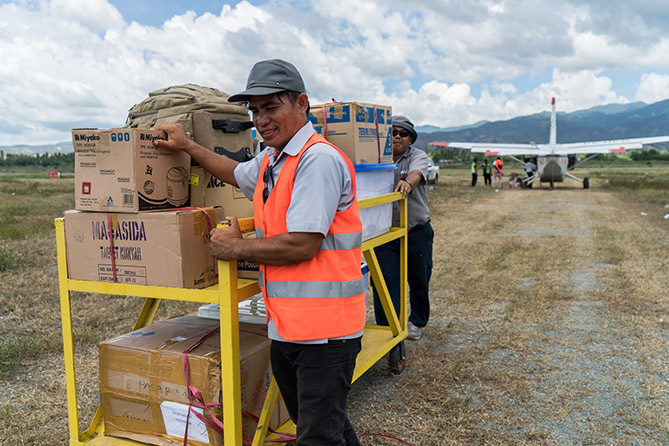 MAF has been coordinating with partner organizations, including Ethnos360 Aviation, Helivida, and ASEAN Coordinating Centre for Humanitarian Assistance (AHA) to plan a response. Today, members of MAF’s Disaster Response Team travelled to Balikpapan, Kalimantan, close to the Indonesian island where the disaster occurred. An MAF plane has been relocated to the area to view the affected area and assist with relief efforts if needed. Requests for assistance have so far been received from AHA who are trying to access the area to bring humanitarian aid. 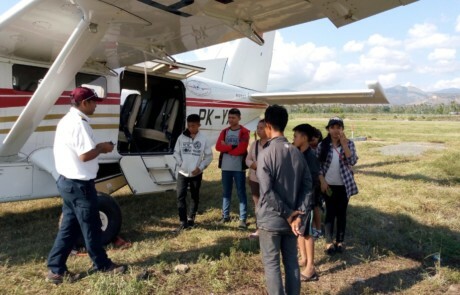 Ethnos360 Aviation has asked for help to get their local Indonesian school kids and workers from Palu back to their home areas in Ampana and Luwak. Early reports indicate that there have been at least 844 fatalities, 632 major injuries and there are 934 affected villages. Tens of thousands of homes have been destroyed and in some areas ground liquification has caused homes to be submerged in mud. 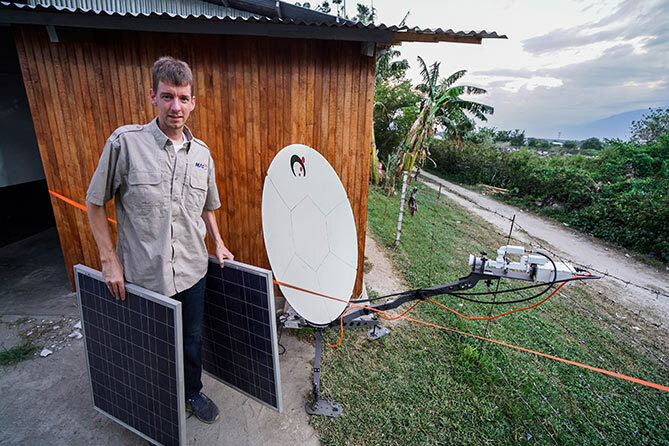 Challenges include lack of electricity and unstable communication lines and channels. Damage to roads and ports are currently hindering efforts to reach affected areas. Flight coming into Palu airport yesterday were disrupted by people trying to leave the city. There are reports of widespread looting of aid trucks and travel chaos. Food shortages and a lack of clean water are making many survivors desperate. The priority is reaching the worst hit areas quickly. 1,536,367 people are potentially affected by this event across 6 regencies and 85 districts. There are 48,025 displaced persons in 103 evacuation sites. – For those who may still be trapped in the rubble. – For those who are injured or who have lost loved ones. – For protection from further earthquakes. The area is experiencing aftershocks, including a 5.5 quake on Monday. – For an end to the looting and violence. – That the agencies responding to the need would be able to gain access to Palu and that aid would reach those in greatest need. Pray for those affected and for wisdom for the government and humanitarian agencies as they look to address this crisis. Lift up those who are most vulnerable, including children, new and expectant mothers and those cut off by rockslides. Pray for favorable weather as relief and rescue missions continue. 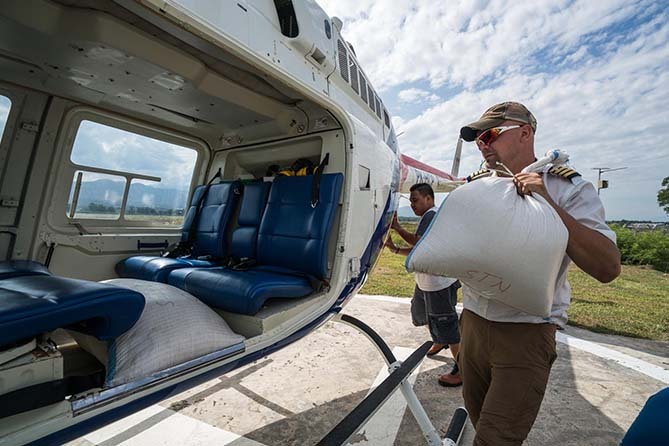 Pray for the resources needed to help meet the need for relief flights. Please consider a special gift at this time which will help keep our planes flying.